The Raucous Royals: A sneak preview of I Feel Better with a Frog in my Throat.... and the censorship begins! 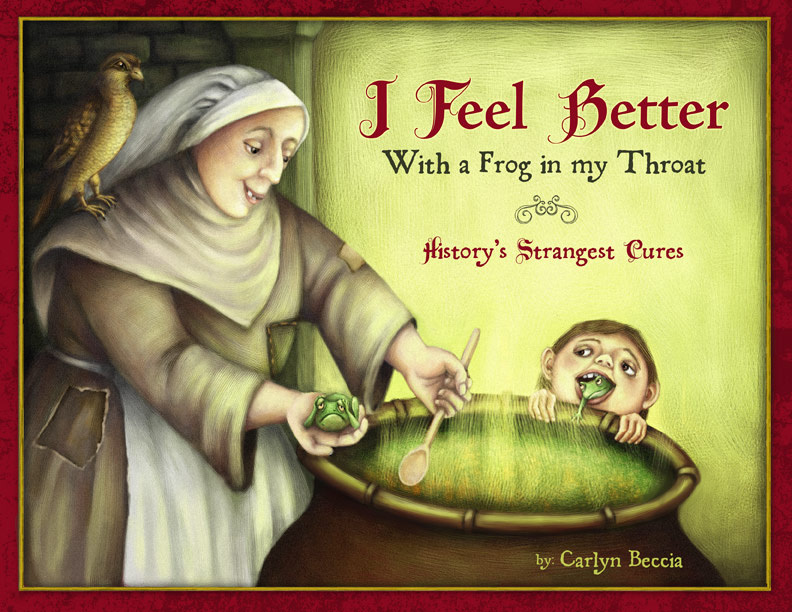 A sneak preview of I Feel Better with a Frog in my Throat.... and the censorship begins! A few months ago, I got a letter from my editor telling me that a well-respected librarian refused to carry I Feel Better with a Frog in my Throat because she was afraid that children would think the people of minorities shown in the book only existed in the past. My first reaction to this comment was the same feeling that I got when I hid Jennifer Nagel's chair on her in the first grade. I thought hiding Jennifer's chair would be funny. She was my friend and we were always playing pranks on each other. What I didn't forsee was Jennifer thinking her chair was where she left it and falling straight on her arse. I will never forget the look in Sister Agnes' eyes. I could count every line in the road map of her furrowed brow and they all pointed in one direction—utter disappointment. That was my first reaction. I had done something horrible and just like Jennifer's sore bum; there was no way to fix it. 'People look for whether a picture book has followed the "rules" about what is right and healthy for children. This comes into conflict all the time with those things that are mysterious, because no serious artist’s work is ever just a single thing. What I object to is that picture books are judged from a particular, pedantic point of view vis-à-vis their relation to children- and I insist that any work of art is much more. Besides, children don't need this approach to a book. They are much more catholic in taste; they'll tolerate ambiguities, peculiarities, and things illogical; they will take them into their unconscious and deal with them as best they can. 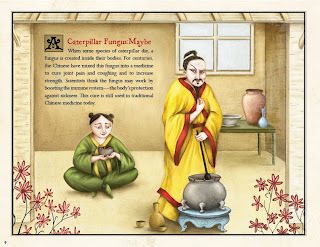 It is a sad thing when this kind of censorship shapes which picture books get in front of kids because I believe it makes artists and writers afraid to give a part of their deepest selves. Yes, we should always tell the truth, but should we stuff that truth into a prescribed checklist of politically correct interpretations? Don't children deserver better than that? The book includes history's strangest cures from maggots, mud, and mummy powder to leeches and purging and then explains why doctors believed they worked, but the last page contains a 'cure' that every child has used throughout history - kisses. I know it sounds corny, but I wanted to show that medicine has progressed because the power of hope pushed it forward. This final spread is "my peculiar vein" and just so happens to be the page that this librarian most objected to. The last page is the only page in the book that illustrates a modern mother and child and that mother and child are white (gasp!) while the minorities depicted are set in the past. Her logic was that because only a white mother and child get a modern depiction that kids might think only whites are modern. Really, I might think this too if my head was trepanned with a blunt object (one of the many cures). When I was working on this page, I pictured one image over and over again - a child holding my book in their hands with a sick parent, grandparent, sibling or pet and they can do absolutely nothing to make them feel better. Who has not wanted a little bit of hope in the face of hopelessness? Does hope need the right skin color to resonate with a child? I guess I will find out when the book is released, but I believe it does not. 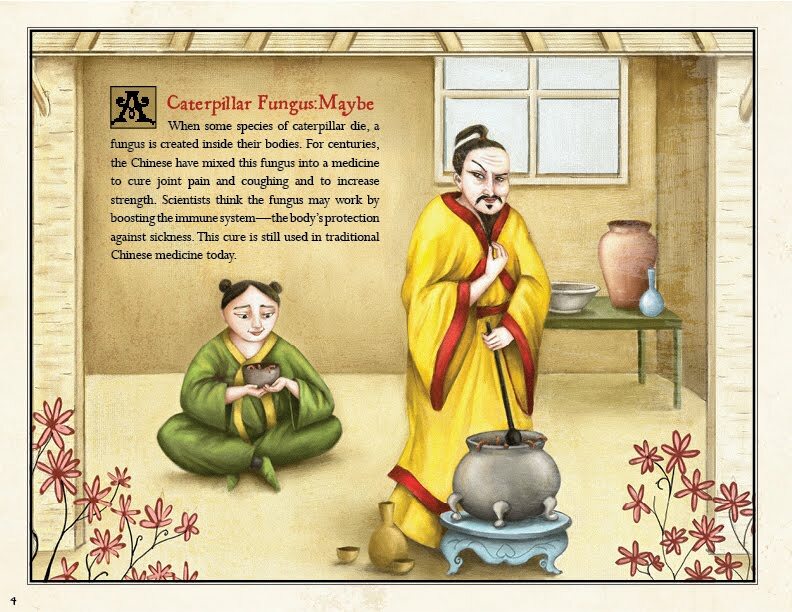 Above: did caterpillar fungus cure? Now being a people pleaser, I thought long and hard about what I could have done differently to not get such a negative reaction. Maybe I could have shown tiny mothers and children of every nationality stuffed into the last frame of the final spread? Unfortunately, if you have ever been ill and had your child come to you with a glass of water, a warm blanket or even a kiss then you know this is a very intimate moment. A rainbow tribe singing Kumbaya would have only cheapened these very intimate emotions. 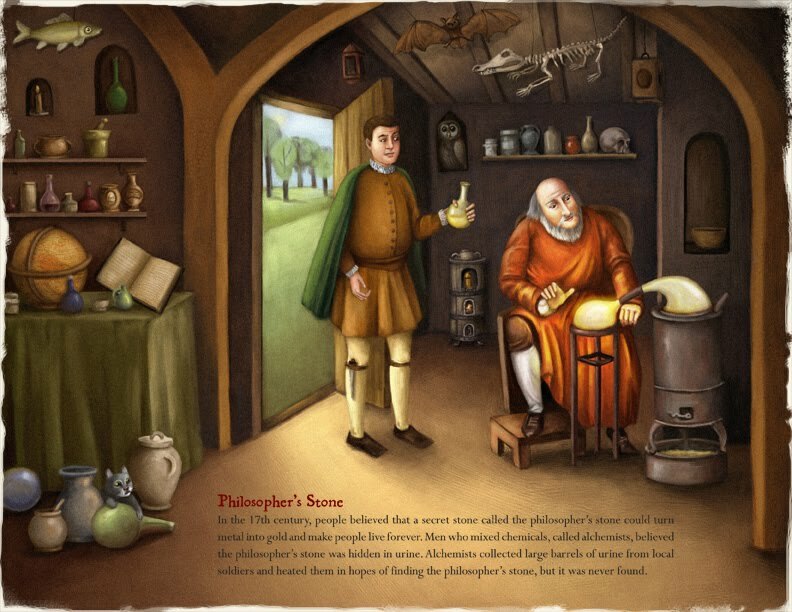 Above: the philosopher stone holds the key to never getting sick. Don't get me wrong. This is not an attack on librarians or this particular librarian. I love librarians. They are our brave gate-keepers with the impossible job of keeping our children safe in an unsafe world. I may write children's book for children, but I want to make librarians proud. But censoring children's books on the grounds of political correctness only serves to make a Faustian bargain with young readers. They may gain knowledge, but at what price? Is it worth losing the soul of a book? A terrible thing to censor a book for children!! Most of the old children's stories are really frightening...and delicious. I never understood censorship. As a book-obsessed kid, I never once thought "Oh, my, are all the minorities represented in this book in a non-stereotyped and in the most sensitive way possible?" No. I just wanted a good story and good pictures (if applicable). I think grown-ups think too much about the contents of kids' books these days. We should just be happy they've unglued themselves from the Xbox and are reading. I'm not sure why anyone would be describing this librarian as 'well respected' - they sound quite ignorant! One can only imagine the distorted view this librarian has - don't let it affect your wonderful presentation of History! The children reading your book have never seen a non-caucasian before and will think they only exist in history. Some time far in the future, things called television and internet will be invented and then the children will realize many races exist. Until then, we must censor diligently! (ok, I'm sarcastic this morning.) I'm supposing there are no books in that library that refer to minorities in modern times? How did that woman get to be in charge of anything? This is one of those posts that I probably should have never hit publish, but I have been so mad about it for months and this morning I had a little too much coffee....and ranting happened. I suspect MANY authors get their books censored and never know about it. I respect this librarian for taking the time to write to my publisher to give her reasoning for not carrying the book, but I still don't understand her reasoning. Political correctness is so pointless since it is leading us into a world where one can't say or do anything. Children do not think like adults do- in many ways they are smarter than us because they are less judgmental and they just enjoy the simple messages. Shame on that librarian for over analyzing what is supposed to be a beautiful sentiment in our history and creating a problem where there is none. I can't wait to read your book and if I had any children your books would definitely be added to their bookshelf. Don't let some huffy librarian's opinion change how you feel. You should be proud of your accomplishment! Isn't the premise behind the objection that books are the only place that children are encountering minorities? (It also seems to presume that the readers themselves are white.) Would the librarian's alternative be never to include minorities in works with a historical angle?! It seems more and more that society is allowing political correctness to overtake plain old common sense! Carlyn, all I can say is, "Good grief. What on earth is this world coming to that this book would be censored?" The older I get the less patience I have such ridiculous, politically correct horse poop. I am agreeing with Barb's Good Grief! Amazing and outrageous. On the positive side, I've now learned about an awesome sounding book that I will make sure is represented in our library. Can't wait to read it! I love your illustrations of the mother's kisses, they're so charming & amplifying the closeness, coziness by having each pair in a "window" as you have is very cleaver. This librarian presumes too much & clearly does not think at all like a child, not with a complaint like that.